For me, and probably Chris, the Labor Day 2006 weekend ranks as one of our best “fishing weekends.” Ever. We drove to the cabin Friday night and arrived about seven thirty. After quickly unpacking the car and settling in, it was off to bed at an early hour. Four-thirty came early the next day, as it usually does, but we were on the road about an hour later. 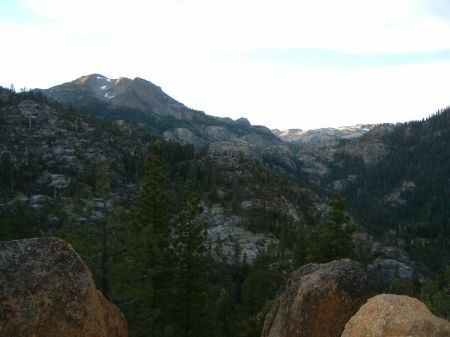 With lunch in the cooler and fishing gear in the trunk, we crested Sonora Pass at just about sunrise. Chris’ catch on Wolf Creek. We couldn’t have had better weather at 9,000+ feet. Blue skies dotted with puffy while clouds greeted us as we pulled to the side of the road just east of Tioga Lake. 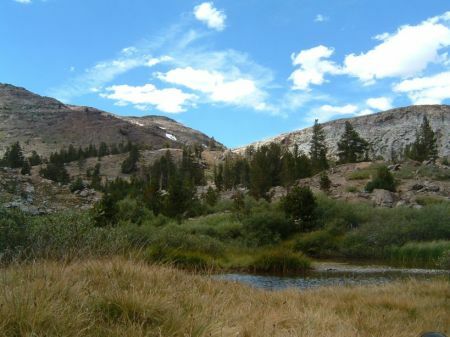 We started stalking the brookies in this very small and often shallow section of Lee Vining Creek with surface flies. These fish didn’t want to have anything to do with me, so I strolled back to the car for my spinning rod. 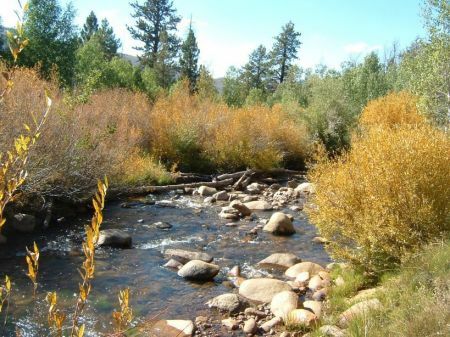 Upon my return, I avoided casting a shadow on the water and kept a low profile just upstream from a group of brook trout and cast my favorite Panther Martin (gold blade/red body). On about the third cast I had a taker and landed a small, but very brilliant brook trout. Chris, who was bit more nonchalant about wading into the water with his boots, used a fly to land a brookie, also about eight-and-a-half inches in this area. 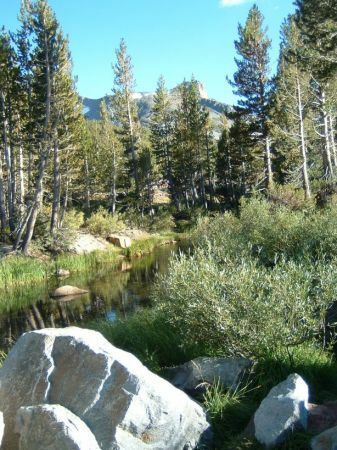 A bend in Lee Vining Creek. This section of Lee Vining Creek also meanders into a bend that one might call a very small lake or big pond, but whatever it’s called, it is deep. Chris spotted some fish that looked like more small brook trout hovering just under the surface near the creek outlet but with trees lining the shore, he couldn’t quite get a fly out far enough, though he did get a few strikes. Sizing up the situation, I knew there was only one lure to turn to: a Kastmaster. Rigged with a 3/8-ounce gold Kastmaster, I threw — not cast, not tossed — this lure more than halfway across this little lake. Almost every other cast was met with a strike, and it was probably no more than five casts between each hook up. These were some of the most aggressive and acrobatic rainbow trout I have seen. Who cares that they were probably planted! Picture in your mind casting a lure about 200 feet and having it attacked shortly after you begin your retrieve. Once hooked, the fish goes wild, jumping three or four times and sometimes clearing the water before you’ve pulled him even halfway to shore. In our case, these antics often led to an “unassisted release,” but such is the dilemma of the barbless hooks that come with practicing catch and release. But it’s always a great day when you loose tracks of the number of strikes or lost fish. In addition to their aggressiveness, these were some hefty trout. After hammering one pocket of the lake, we moved ten or fifteen feet down the shore to another point. Chris eventually walked back to the car to get his spinning rod, but couldn’t seem to get many hook ups. After watching me, he figured out that he was going too deep, so with a lighter lure with a faster retrieve, he joined in the fun. Our little jaunt around this little lake netted about 15 rainbows ranging from about 12 to 14 inches for me, and five for Chris. 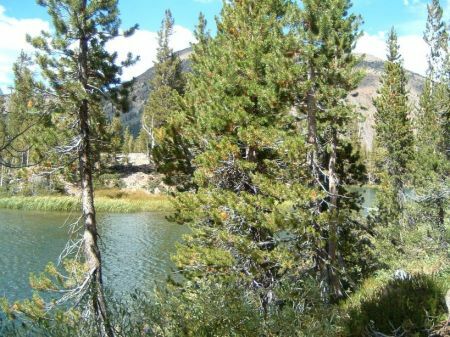 This little lake once again turns into a creek paralleling Tioga Pass Road, and in following it we hit likely pockets and pulled in a ‘bow here and there. 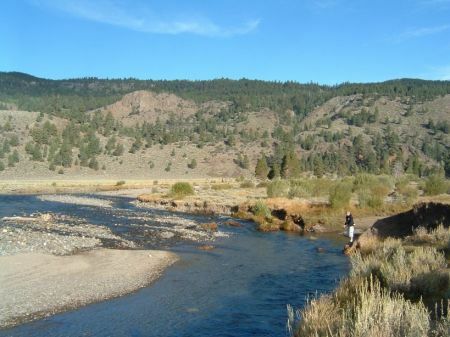 At one deeper pool, we each pulled out a few more fish before heading back towards Little Wolf Creek for few casts before we had to head back over the pass. While my luck held true to form — a few strikes on lures and nothing on flies — Chris pulled about four fish from the same little pool we had targeted in the morning. But after watching the last rays of the sun fade, it was time to head home. The plan was to stick around Twain Harte (where our cabin is located) on Sunday, but Saturdays’ fishing fever was still with us. Even though it was late in the morning, we again hit the road in search of finned fun. In the spirit of trying new waters, we headed up Hwy 108 towards the pass, without an inkling of where we might stop. We finally settled on the Clark Fork of the Stanislaus River. I started out with spinners, but soon found that it was near impossible to target many of the likely pools because of over-hanging bushes. I did eek out one strike in a deeper pool, but that was it. 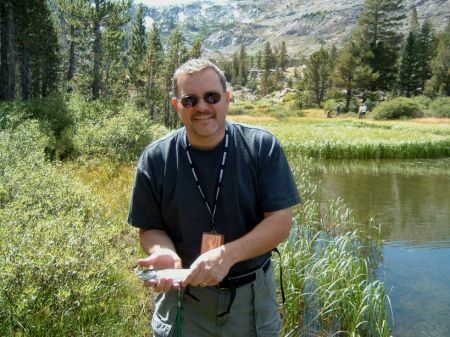 Chris, however, was able to entice about half a dozen strikes from the same pool by using various bead head flies, including a few hits from what appeared to be a “monster fish.” But we left the Stanislaus, without landing a fish, and headed over Sonora Pass yet again. 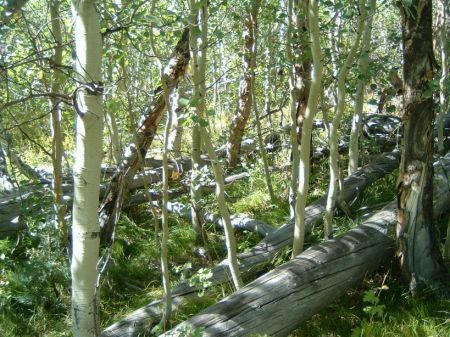 Our intentions were to head back to the South Fork of the Lee Vining Creek, but since it was late in the day we set off for other unfamiliar waters. We ended up on a section of the Molybdite Creek, near the Obsidian Campground. This is a little creek that branches off of the Little Walker River and requires some precision. It also should require Kevlar pants. I, however, was wearing shorts. But I’m not intimidated by “adventure fishing” and we headed upstream — Chris with his fly rod and me with my spin casting equipment. I moved ahead of Chris as there were fewer pools suitable for a spinner, while he moved a bit slower, throwing a fly at likely pools. I was probably 50 yards or so upstream from Chris, and wondering if I might not catch anything, when I was almost shocked out of my socks when my gold Panther Martin was attacked in a pool no more than five feet long, four feet wide and maybe three feet deep. Out of this small pool came a vibrant rainbow about 14 inches long. Realizing that I had forgotten my forceps, and hoping that I might catch more fish, I headed downstream to find Chris attempting to free his line from a branch that was underwater. He had hooked a fish that then wrapped his line around the branch and employed a “self release” maneuver. After helping Chris free his line, I borrowed an extra pair of forceps and headed back upstream. 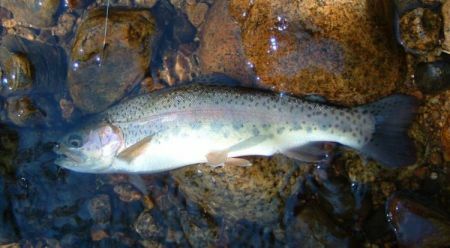 WILD rainbow from Molybdite Creek. 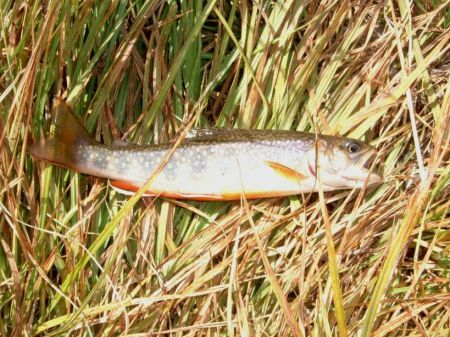 No longer questioning that trout might reside in almost any pool on this stream, I tossed my lure into almost any water deeper than six inches, making slow progress through the brambles and fallen trees while avoiding cow pies. About 100 feet further I found a wide and shallow bend. After slowly covering most of this section with half a dozen casts, a trout broke the surface, diving after my little bumble bee pattern Panther Martin with a silver blade. I placed the spinner in the same spot and he struck again. Apparently this rainbow wanted to be caught…with cast three the fight was on! Though this trout was “only” about 12 inches, it covered the entire width of the stream a few times before allowing me a close look and a quick release. While I only pulled in two fish and Chris had only one hook up during about 90 minutes on the Little Walker, this was a great introduction to a stream I may visit again. But by now it was getting close to sundown. Since we had to head back over Sonora Pass, we stopped, of course, at Little Wolf Creek. Chris set off on a smaller branch of the creek while I headed upstream to a small bend where the water cascaded over boulders into a wide and deep pool. Picking a central position, I was able to cast both upstream and down stream. Within a dozen casts I had a decent rainbow on, ending up releasing an eleven incher. I was joined by Chris, and over about an hour we pulled in five more trout. Knowing it was almost time to go we slowly walked downstream, hitting various pools as we went. About 30 minutes later — with three more fish for me and a couple more for Chris — we ended our great fishing weekend. But what a weekend to end the summer! 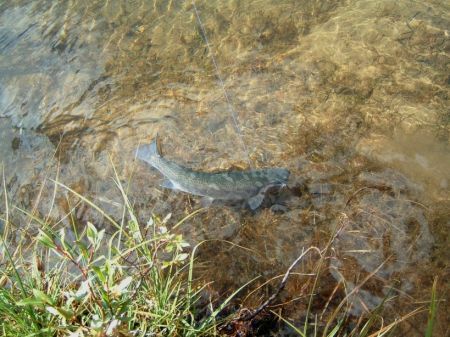 When we finally departed Little Wolf Creek Sunday evening, we calculated that the two of us had landed about 57 rainbow trout, 1 brown and 2 brookies. Not bad for two days of intense fishing fun! 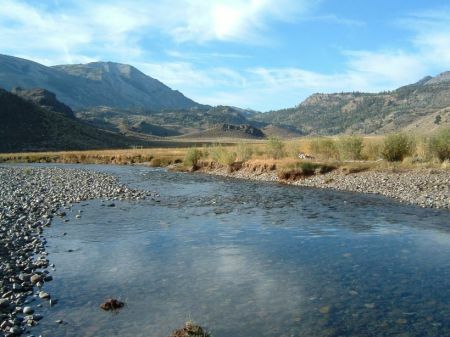 West Walker River, just about right. 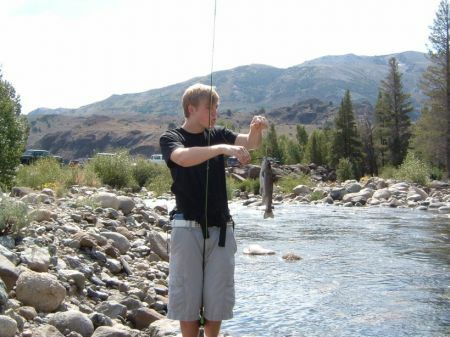 Chris fishing the West Walker River. Looking downstream on Lee Vining Creek. 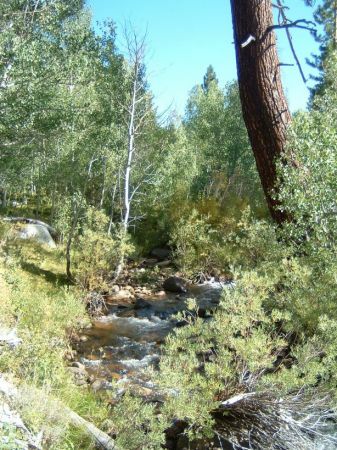 Looking upstream on Lee Vining Creek. Lee Vining Creek Brook Trout. Chris on Lee Vining Creek. 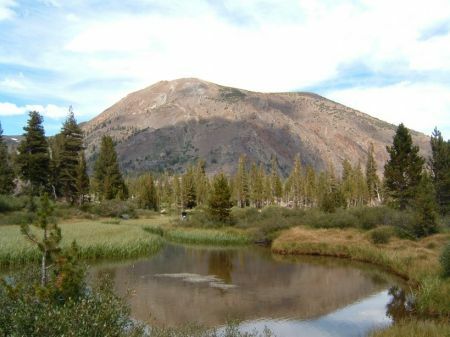 The “lake” created in a bend of Lee Vining Creek. Me and a Lee Vining Creek Rainbow. Chris on another section of Lee Vining creek. 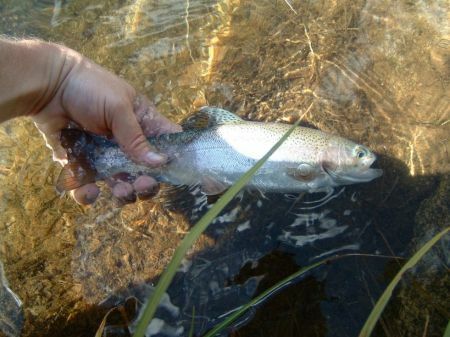 Another Lee Vining Creek Rainbow. Looking upstream on Little Walker River. Nice section of Molybdite Creek that yielded a few fish. 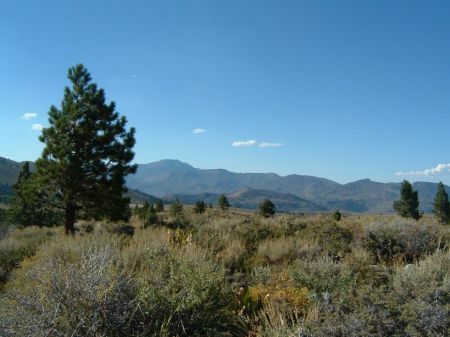 Looking out towards the West Walker River. 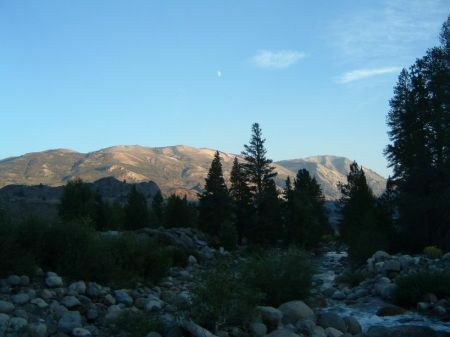 Sunset over the West Walker River. 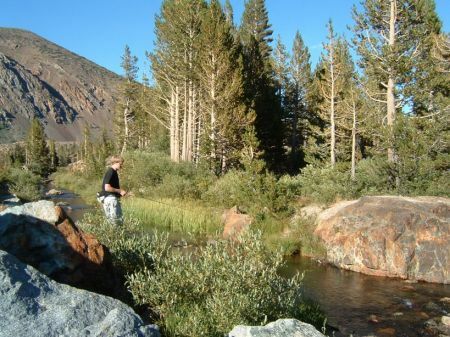 Categories: Fly Fishing, Vacation & Travel | Permalink.